Suhas Satheesh is a volunteer with the Silicon Valley chapter of Asha. 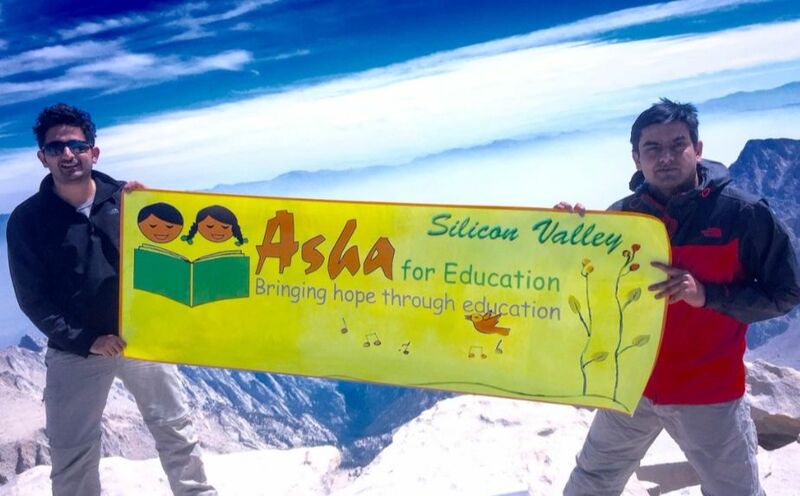 On the bright morning of 30th August 2015, an Asha for Education Silicon Valley chapter banner was soaring high at the highest point in continental US. At 14,505 feet, Mount Whitney is the highest mountain in continental US, requiring a climb of over 6,000 feet spread over 11 miles one way. The moment I had been planning and preparing for over 100 days had finally arrived and it felt just as wonderful as I had pictured it all along! For most part of my adult life, I have taken keen interest in socio-economic inequalities prevalent in our society, especially in the context of India. Something that I could never make my peace with, and probably never will, is that merely by the circumstances of your birth, the choices you need to make every day are wildly different. There is no ‘right’ choice to make if you have to choose between education and health. There is no ‘right’ choice to make if you have to choose between health and safety. There is no ‘right’ choice to make if you have to choose between safety and progress. One thing that became increasingly evident to me was that there is no panacea in the form of a magic wand to create a level playing field in a day, a month, a year, or even a decade. Hence, I made my peace with incremental progress in the right direction. In my mind, the right direction is education and the right means to do that is through a secular, non-sectarian, apolitical, volunteer driven organization like Asha for Education. I joined as a volunteer with the Silicon Valley chapter about a year ago and since then, not a single week has passed without some involvement with the organization. Through chapter meetings, fundraising events, site visits, stewarding projects, etc. my learning curve has been steep and satisfying. I have gained deeper understanding of the problems plaguing our country and higher respect for leaders working on solutions on the ground. It blows my mind that in its 25 years of existence, Asha for Education has disbursed over 32 million $ to over 400 project partners in India, changing the lives of hundreds of thousands of underprivileged children forever. I would like to end this piece with something that I notice in every single chapter meeting, held every Wednesday evening. As I stare into the meeting room, sometimes filled with a lot of people and sometimes with only a handful, I notice volunteers coming from different walks of life, with different religious inclinations, with different political inclinations, and different philosophical inclinations. However, I speak for all of us when I say that in our heart of hearts, we are all convinced that education is the ultimate tool to empower a community, a country, and the whole of humanity. I work with Asha for Education because the cause is right and the time is now.